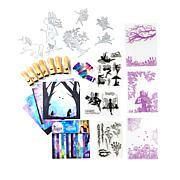 Create lovely, coordinating crafts with this selection of dies, embossing folders, papers and more. 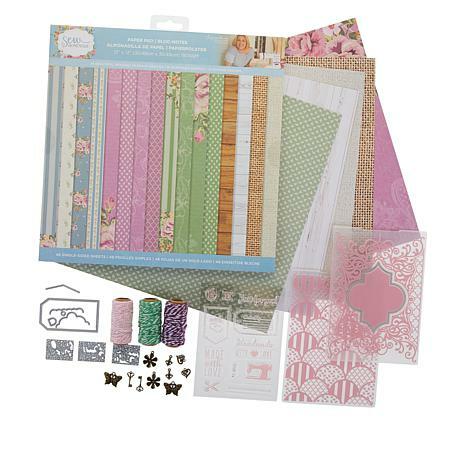 It's everything you need to create a card or papercraft project that shows you care! Sew Homemade Clear stamps "Homemade with Love"
Sew Homemade 5" x 7" Cut N Emboss Folders, "Decorative Lattice Frame"
Sew Homemade 5" x 7" embossing folder "Patchwork Clamshells"
- Largest approx 1.6" x 1.1"
- Largest is approx 1.7" x 3.1"
Use the dies to create a variety of embellishments and flourishes for your paper crafting projects, cards and gifts! 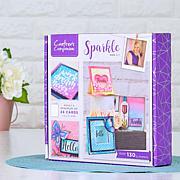 Wonderful for Cardmaking, Invitations and more! To use these stamps simply peel them from the backing sheet and place onto an acrylic block (not provided) ink the stamp up and stamp. Once you are done simply peel the stamp off the acrylic block and wipe clean with an alcohol free baby wipe or wash in soapy water, leave to dry and return to the clear backing sheet. This kit is FULL of goodies. Very well worth the $$. Love the variation of dies and die inserts. The embossing folders are 5x7 and so pretty. Not disappointed at all in this kit! This set is just lovely. I adore the fact that the embellishments are silver tone, and the twine is subtly coloured. The papers themselves remind me of the old Heritage Collection papers I've amassed over the years. The emboss folders do a great job, and the designs are universal depending on the paper used. The stamps and dies take a little patience because of their size, but overall, they look great when finished! Very nice set-AND it ALL coordinates!